Summary and Definition: The Abenaki were farmers hunter gatherers and fishers whose lands stretched from Lake Champlain, the St. Lawrence River basin and south into Maine and northern Massachusetts. The Abenaki lived in wigwams or longhouses and their clothes were distinguished by the ethnically distinct, pointed or peaked hoods that the Abenaki people wore. What language did the Abenaki tribe speak? What was the lifestyle and culture of the Abenaki? The Abenaki, or Wabinaki, were part of a confederacy of Algonquian speaking tribes. The Wabanaki Confederacy consisted of five principal Nations: the Abenaki, Micmaq, Maliseet, Passamaquoddy, and Penobscot. The Abenaki people were hunters, fishers and farmers who lived in wigwams made primarily of birchbark. Birchbark was an extremely important material and was used to make canoes, shelters, clothing and containers. The 1500's saw the first European explorers. The French established New France and the English began their colonization process. The lands that now cover the US states of Maine, New Hampshire, Vermont and Massachusetts encroached on Abenaki territories. The Europeans brought devastating diseases such as smallpox, influenza, diphtheria and measles and a series of epidemics killed many Abenaki who had no immunity to such illnesses. The French and Indian Wars raged for 75 years as France and England fought for the lucrative new lands. The Abenaki become allies of the French. The Abenaki first became involved in the fighting through their friendship with a Frenchman, Jean-Vincent d'Abbadie de Saint-Castin (1652–1707) a French military officer serving in Acadia who became an Abenaki chief. Defeat in the wars and inter-tribal warfare resulted in the scattering of the Abenaki people and many relocated to Canada. Where did the Abenaki live? The Abenaki are people of the Northeast Woodland Native American cultural group. The geography of the region in which they lived dictated the lifestyle and culture of the Abenaki tribe. The Abenaki tribe lived in Wigwams aka Birchbark houses. This type of shelter, conical or domed shaped, or occasionally pyramid shaped wigwams, were common to the Algonquian speaking people. Wigwam is the word for "house" in the Abenaki language. The wigwam varied in size housing up to 27 people in a village and temporary wigwams used on hunting trips that housed just 3 people. Wigwams were built with wooden frames that were covered with woven mats, sheets of birchbark and animal skins. Ropes were wrapped around the wigwam to hold the birch bark in place. Many other Abenaki lived in oval-shaped longhouses. Inter-tribal warfare was harsh and frequent so people lived in fortified longhouse villages surrounded by fencing (palisades) and reinforced with mud. Longhouses were built up to 200 feet long, 20 feet wide and 20 feet high. What clothes did the Abenaki wear? The clothes worn by the Abenaki varied according to the season. In the hot, humid summer the men wore breechcloths tucked over a belt that hung to mid-thigh at the back. The breechcloths were often accompanied by leather leggings kept in place with strips of cloth like garters to protect their legs. The leggings tapered towards the ankle and the outside was decorated with a fringe or beadwork. Moccasins were made with a long tongue and a high collar that could be folded up or down. In the wet and snowy winters snowshoes were also worn during the winter. 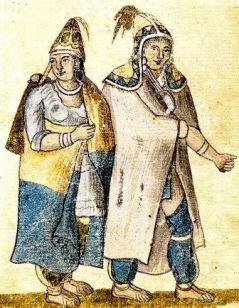 The Abenaki women wore deerskin wraparound skirts or dresses and also wore leggings. In the winter cloaks made from buckskin or other animal skins were worn by both men and women. The Abenaki also wore highly distinctive, embellished pointed or peaked hoods made from birch bark or leather that covered the shoulder decorated with feathers or tufts of animal hair at the point. What food did the Abenaki eat? The food that the Abenaki tribe ate included crops they raised consisting of the "three sisters" crops of corn, beans and squash together with sunflowers, the seeds of which were crushed for their oil. Fish such as sturgeon, pike and bullhead were caught. Hunters provided meat from deer (venison), bear, moose and smaller game like squirrel or rabbit. Birds and waterfowl such as duck, grouse and wild turkey also added to the variety of their food. Their diet was complemented by vegetables, mushrooms, nuts (acorns, hickory and butternuts) and fruits (plums, cherries, blueberries, strawberries and raspberries). Maple syrup was obtained from the sap of the maple tree. What weapons did the Abenaki use? The weapons used by the Abenaki included war clubs, tomahawks, battle hammers, knives, bows and arrows, spears and axes. Abenaki History: What happened to the Abenaki tribe? 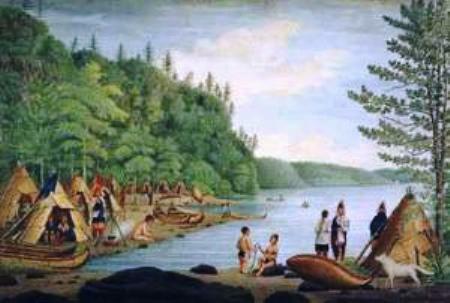 The following Abenaki history timeline details facts, dates and famous landmarks of the people. The Abenaki timeline explains what happened to the people of their tribe.